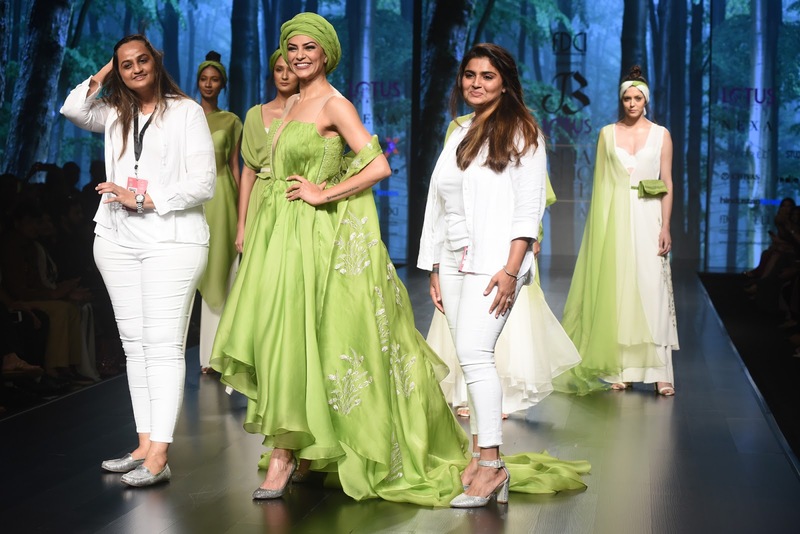 Day 2 At India Fashion Week SS 19 started off with a bang as the sensuous Sushmita Sen walked down the ramp in a striking green ensemble by Designer Bhumika & Jyoti. The first zero-waste fashion store in INDIA, showcased their latest collection ‘Limoncello’ in sync with the theme- ‘Lightness of Being’. India Fashion Week gave way to some edgy, dynamic and vogue setting designers to showcase their remarkable collections sheathed by sizzling models, climaxing with stunning showstoppers. The spectators enjoyed a spread of cultural tradition and fresh innovation. SIYAAHI by Poonam & Rohit, were the second to showcase their collection ‘Story of Graciaa’ in the Lightness of Being show. The collection aimed at achieving contemporary silhouettes for women with a touch of soberness and simplicity. Story of Graciaawas inspired from the flower, Dahlia which is an epitome of grace and elegance. 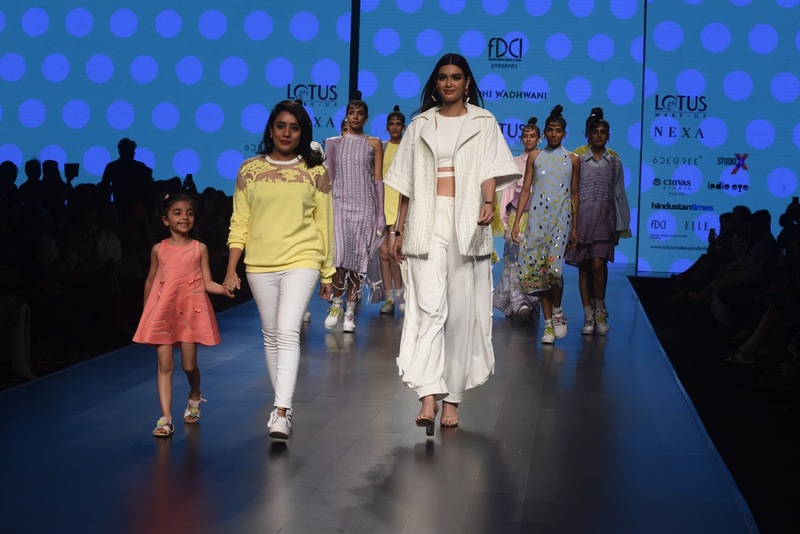 Flowing long dresses, quirky crop tops, draped skirts, sarees and lehenga choli connected the dots of fabric with a perfect balance of colors and hues. The beautiful Sophie Choudry graced the ramp for Abstract by Megha Jain Madaan, anexpressive and experimentative label. The label showcased its latest collection which took inspiration from Underwater Lightness. Indian drapes were infused with a sense of modernity where fluid fabrics such as Banarsi tissue gave a metallic effect with the colour story, that moved from Tiger Lily to Otter to Dandelion. 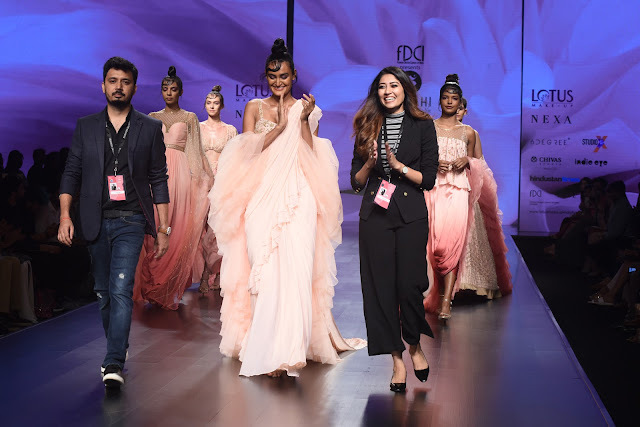 Diana Penty dazzled the ramp as she closed the first show of the day with Designer Vidhi Wadhwani’s collection ‘Ikigai’.‘Ikigai’ is a Japanese term for “reason for being”. The collection was inspired by the designers’ recent trip to Japan, a country of sensory overload, where old world charm meets modern technology, where populism meets minimalism. Elements like these were subtly incorporated in the Ikigai, which embodied the spirit of feminity and strength. The stunning ensembles plus in attendance admirable designs added a striking charm to the show along with the stunning showstoppers! The collection showcased promises much more enterprising magnificence, style and the never-seen-before fortitude of fashion.